Protector, originally uploaded by Araleya. 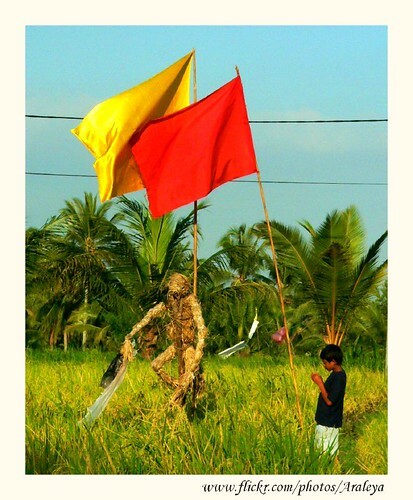 At evening, paddy field in Ubud, Bali is so lively with lots of people, birds, and flags as if there were festival. I stopped mountain very often to take shots, parked it and walk through the small dike of paddy field. It took sometimes for me to understand why the boy stood still there.. He played something in his hands and for a while he rewinded the little wheel hanging on the pole that made some noise, the flags and the human-like model (tetakut) were all tools to chase away the birds from taking the rice grains. Later I knew from the local man that.. rice production is not sufficient for consumption though Bali is so green, it still needs to import rice, so its very essential for farmers to work almost whole day to chase away the birds..